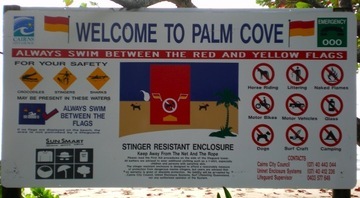 Here is the welcome that we received at the beach at Palm Cove, Australia. And this other sign was there too, just in case the first one wasn't terrorizing enough. 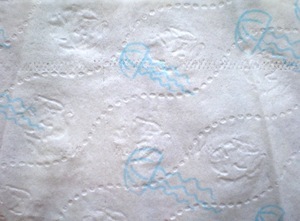 And then in our hotel room, the toilet paper was decorated with.... what would you guess? Can you see the blue print on this sample? 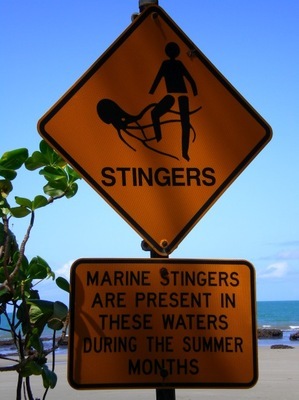 Stingers! Why would they think potentially fatal stinging jellyfish make a lovely design for this item? Oh, and by the way... HAPPY BIRTHDAY KAYLA! Buy my new book from Amazon! This is a Flickr badge showing public photos from llfrost. Make your own badge here.